Carlisle Barracks, Pa. — Kory Anderson of West Fargo, North Dakota participated in the U.S. Army War College 64th annual National Security Seminar in Carlisle, Pa., June 4-7, 2018. 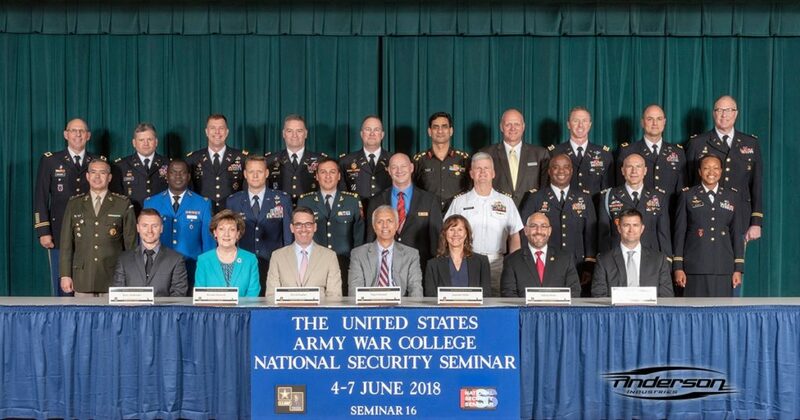 Anderson was one of 160 business, government, academic and community leaders selected from across the country to take part in the week-long academic seminar alongside the students of the Army War College. During the special academic event, Anderson represented fellow American citizens in discussions with the next generation of senior leaders of the U.S. Armed Forces. For the senior military leader-students, these exchanges enable a deeper understanding of perspectives from across the American society they serve. The National Security Seminar was the capstone event of the Army War College’s 10-month curriculum, just before the Class of 2018 graduation ceremony to confer the USAWC diploma and master’s degree in Strategic Studies. NSS featured speakers addressed the diplomatic, informational, military and economic (DIME) instruments of power for “America’s Strategic Role in the World” -- Ambassador Kristie Kenney, Career Ambassador who served as U.S. ambassador to Ecuador, Thailand, and the Philippines; Mr. David Sanger, chief Washington correspondent for the New York Times; Admiral Kurt W. Tidd, commander of the United States Southern Command; and Ambassador Ron Kirk, former U.S. Trade Representative. The mission of the U. S. Army War College since 1901 is to educate and develop leaders for service at the strategic level, while advancing knowledge in the global application of landpower. The Army War College resident education program, which sponsors NSS, is the signature program among its education programs for strategists, senior leaders, and Army general officers.